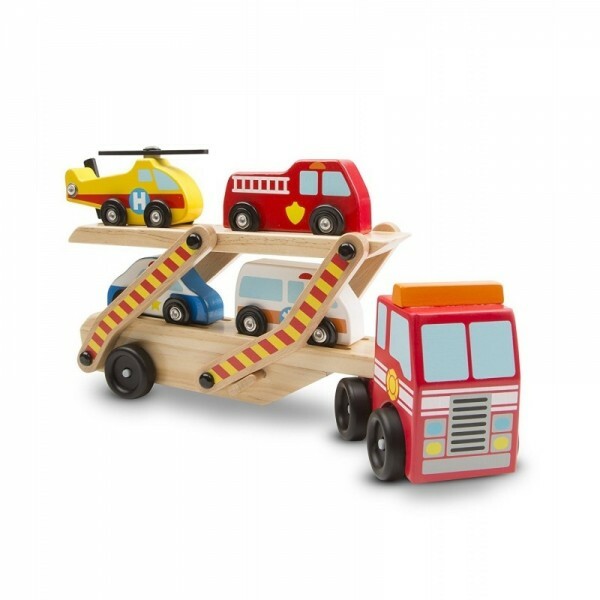 This giant two-level tractor-trailer comes stocked with four wooden emergency vehicles and delivers endless play possibilities! Lower the upper deck to extend the truck to nearly two feet long and to allow the vehicles to roll off and race to the rescue. There's a helicopter with rotating blade, a fire engine, police car, and ambulance, so there's everything you need to race to the scene whenever there's an emergency situation! With plenty of educational benefits, the smoothly moving parts help kids three and older develop fine motor skills, movement, and hand-eye coordination. Made to the exceptional standards of quality and safety you'd expect for a brand as globally renowned as Melissa and Doug.